Waldheim Gräfelfing is located in a nature protection area in the Gräfelfing district west of Munich. 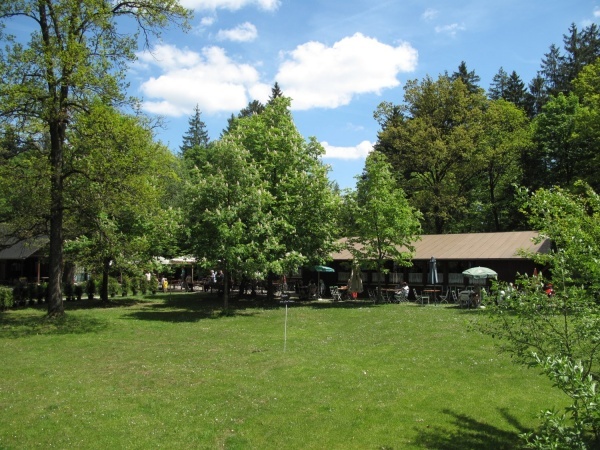 The beer garden is best reached by bike through the forest and is a popular meeting place for families and locals from the surrounding area. Waldheim Gräfelfing is managed by Der Evangelische Handwerker-Verein München (The Munich Evangelic Handicraftsman Association) which was founded in 1848. The organisation has the aim to recruit members with a interest in religion and handicraft. The old building with a restaurant dates back to 1924. The beer garden has 450 seats and is surrounded by nature. Additionally, there is a football field, a summer curling lane, a bowling alley as well as a crossbow shooting range within the grounds. Both the regular beer and Weißbier (Bavarian wheat bear) comes from the Ayinger brewery. A Maß Helles costs €6.00 (May 2018). Waldheim Gräfelfing is open from Tuesday to Friday between 2pm and 10pm and on Saturday, Sunday and public holidays between 10am and 10pm. Closed on Monday.